This was probably the most difficult installation to date… But, there is always a flip side to hardship and in this case it was being in the museum for so many days and trouble shooting the software and piece like never before. I also worked on a new ‘haute couture’ hat with a great woman I met here in Marseille — Margot. 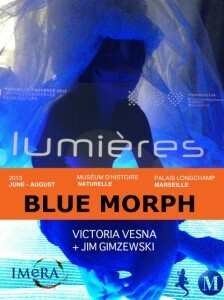 This is definitely a very french version of the Blue Morph!